During your time as a student, you will no doubt encounter your share of academic writing assignments. If you are using sources, you will always be required to write a Reference list or Works Cited page in order to give proper acknowledgment to the authors whom you cited in your paper. This usually entails listing the authors, titles of the work, date of publication, and other details such as page numbers. However, sometimes you are asked to go even further in your reference list. This is where the annotated bibliography comes into play. As you begin to organize your paper, it is important to develop a thesis or topic idea that you intend to research. It is best to get started right away and seek out sources that you will use to support your paper, as this can be a lengthy, tedious process that cannot wait until the last minute. When you are asked to put together an annotated bibliography, you will need to do some critical analysis in order to determine whether the source is relevant and appropriate for your work as well as assessing its strengths and weaknesses. In some cases, you will want to eliminate sources that do not relate well enough to your topic or contain too many biases to be considered reliable. On the other hand, you would still want to include sources that argue against your position since the point of your paper is not to definitively “prove” your argument, but rather to determine whether there is enough strong evidence to back up your claims. A good annotated bibliography is necessary because it strengthens your paper and demonstrates that you took your research seriously. As you are putting together your annotation, keep in mind that they typically share certain universal characteristics. For example, you would definitely need to include the name of the author, the title of the work, the publisher and year it was published, along with a brief description and/or assessment of the work, and reasons why this source was selected for your paper. Of course, it also needs to follow the APA, MLA, Chicago, or Harvard style of formatting. If in doubt, always ask your instructor or professor for clarification. At Order-Essays.com we appreciate how difficult it can be to get your academic projects and assignments completed on time. This is why we are pleased to offer our premium academic writing services. We can completely virtually any type of assignment from essays, quizzes, dissertations and, of course, annotated bibliographies. Our professional writers have mastered the art of writing annotated bibliographies, which means it will be thoroughly researched, written, and completed based on your professor’s exact instructors and will never contain plagiarism. Our annotated bibliography writing service is reliable and affordable. We understand that most students are not exactly making the big bucks yet, which is why we strive to keep our prices low while never compromising on quality. Aside from ensuring that your annotated bibliography is authentic, professionally written and plagiarism-free, we also guarantee your complete confidentiality. So if you find yourself in a rut and can’t complete that pesky annotated bibliography, your best bet is to hire a professional writer from Order-Essays.com to do it for you. It will always be done at the highest level possible and you will receive it by your specified deadline. Contact one of our friendly customer care agents today and let us see what we can do for you! You can always look through our free annotated bibliography example written by our writers! Once you are impressed, feel free to place an order! The process of writing a standard bibliography is not particularly difficult. It is just a matter of listing the authors, titles, publisher, date, and page numbers, and of course making sure it is formatted properly. On the other hand, an annotated bibliography takes far more effort. It is not enough to quickly skim through the sources; you need to provide detailed commentary on each source. It is important to discuss the credibility and reputation of the author(s). You need to explain why the particular source is interesting and relevant to your topic. You also need to provide a critical critique, highlighting the positives and negatives of the research, including limitations and biases. It can get pretty tedious, but if you write an annotated bibliography properly, you will no doubt impress your professor and anybody else who comes across your paper. Before you begin the process of writing an annotated bibliography or even gathering the sources, the first step is to obviously settle upon the topic that you intend to base your research on. Some topics that are fairly timely include gun control, the abortion debate, LGTB rights, immigration, violence in video games, the effects of social media, and many more. If you are curious to look over some of our sample essay papers to get you started on your own essay ideas, we would be happy to assist. Once you have selected the appropriate sources for your paper, it is time to write the annotated bibliography. It should be one paragraph long and between 100 and 200 words. You should discuss the authors of the work and include any information about their academic or research background. This will indicate that they are an authority on the topic, which will lend credence to your paper. You will also want to discuss the main points of each source, why the particular source is relevant to your own work, why it is noteworthy or interesting. The paragraph should end with a discussion about some of the strengths, weaknesses and limitations or biases. Don’t get frustrated. Writing an annotated bibliography just takes some practice. Once you get the hang of it, it will be a piece of cake. But in the meantime, our writers would be happy to assist you with writing a high-quality annotated bibliography for a low price. Thinking about ordering but not sure? Contact our customer care team via live chat, phone or email and they will be happy to answer all your questions. 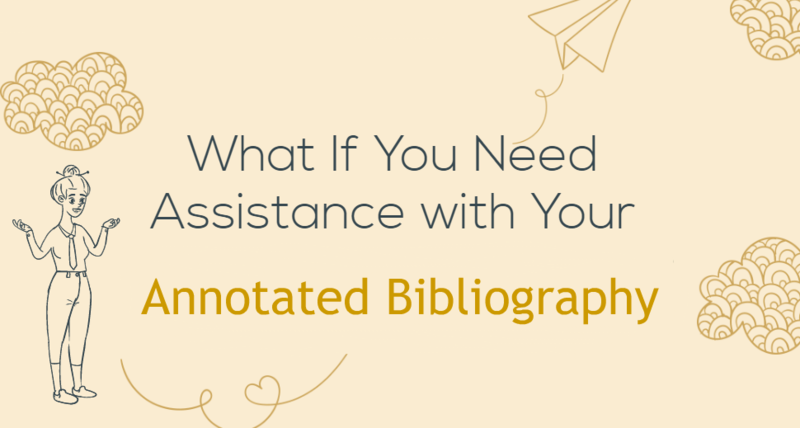 Your Best Annotated Bibliography Is Just One Click Away!